Djibouti (Jibuti, Somali: Jabuuti), officially the Republic of Djibouti, is a country in the Horn of Africa. It is bordered by Eritrea in the north, Ethiopia in the west and south, and Somalia in the southeast. The remainder of the border is formed by the Red Sea and the Gulf of Aden. On the other side of the Red Sea, on the Arabian Peninsula, 20 kilometres (12 miles) from the coast of Djibouti, is Yemen. Djibouti's size is just over 23,000 square kilometres (8,900 square miles) with an estimated population of under 500,000. Its capital is the city of Djibouti. We tend to see very few coins of Djibouti, partly because of its small population, and therefore low mintages. They are denominated in Djibouti Francs (DJF). AMW = Actual Metal Weight in troy ounces of pure gold. 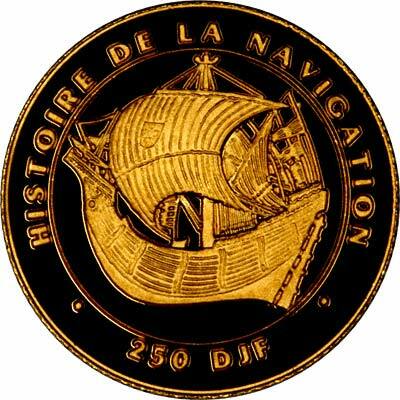 For Djiboutian coins in silver or base metal, or Djiboutian coin sets other than gold, please look at the Djiboutian Coins page of our original website. 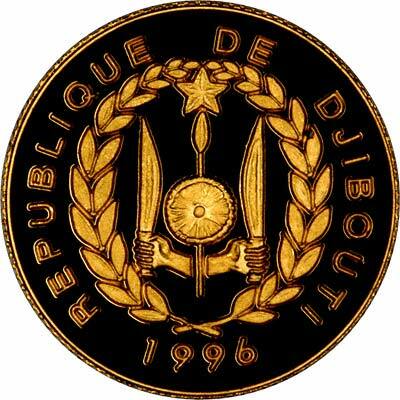 We make an active market in almost all world coins, gold or otherwise, including Djiboutian coins. If you have any of these coins to sell, please contact us, or post them to us for appraisal and offer.